A few weeks ago I was driving to work , listening to my favorite radio station interview a local dance teacher about Nutcracker rehearsals and tryouts for Snowflakes. I have seen the Nutcracker once, and fell asleep during part of it- I blame my holiday diet of straight sugar starting Halloween and going to the first of January. I do remember it was spectacular how graceful the dancers were and the girls enjoyed it . Jesse was nine and McKenna was three and I was wanting a family holiday experience. Topping the list though, is my long-held secret dream to be a ballerina. As I whipped into the parking lot at work, I stayed to listen to the dance lady talk about the auditions . She said,” bring your child down and they can try out, no dance background needed.” I knew in my heart that God wanted me to sign McKenna up. I was convinced that the universe had made me late this particular day so that my child could be a Snowflake. This was going to be a dream come true for both of us! How fortunate am I? Well. I called the ballet school and I asked about the lessons and the lady was very sweet. One of the questions I didn’t ask ,was how much money? Laugh with me, I have seen all the Step Up movies and Dirty Dancing at least 100 times. Nothing can stop a dream. “How would you like to do ballet class and then be in a play, like your sister Jesse?” I asked my youngest daughter sweetly. She shrugged her shoulders, nonchalantly. That being said, I immediately drove to Walmart and bought her pink tights and a black leotard. “This is going to be so awesome!” I said with a big smile. On the Saturday of tryouts, we went to the ballet school. It was a tiny studio and you could see all the older dancers, piroueetting in their pointe shoes. “Oh!” I gasped and held the door for Jesse (still on crutches) and McKenna . “See! See!” I said all excited. Jesse rolled her eyes. McKenna looked at the other girls and at the older dancers, and she sat down. The other parents and I filled out paperwork and fussed around. My daughter didn’t have any ballet slippers, but another mom gave us a pair to try. Mac listened to the dance teacher and did all the moves a little timidly but all the Snowflakes made the cut. No one was in tears and it made me feel great that my daughter had an opportunity to dance with part of the Moscow Ballet and live out my dream at the same time. Thank you youngest child. I see discounted therapy in your future. We are about six weeks into this and I am very nervous. I think Mckenna may be anxious also. They sent us the music for the Snowflake part and I am having trouble downloading it onto a CD. It looks to me like most of the other girls have taken ballet lessons. (What a surprise!) She has practice for a half-hour every Saturday and I have missed every home Grizzly football game this year (Les is not delighted) and the other moms’ run marathons, literally,( not just barely finish a 5K and celebrate at 5 guys). I feel somewhat awkward. The big show is same time the Griz Bobcat game starts, (Go figure?) and McKenna told me this morning she wants to quit ballet. It is Friday night and I watch my little snowflake sleep and I am thankful for this entire experience. It has been eye-opening how quickly I projected something I didn’t even know about myself onto my child. We have practice tomorrow and whatever happens after that, we will roll with it. At least, we have tickets to see the Nutcracker and hopefully my little gal will have a great time with as little trauma as possible. I have learned a valuable lesson about myself in all of this, ( I am a flake) but, I also know all the steps to the routine. Remember, nothing can stop a dream. Right at the end of a beautiful summer in Montana, my daughter broke her leg. She hovered in the air for about 2 seconds I gather , and fell off a friend’s skateboard while I was at work. I got the call from my neighbor that afternoon, which had me concerned because we have that dialogue now, after many trial runs. 1. Call to ask if you can go anywhere outside the neighborhood. 2. Don’t call to tell me you are bored. on her last carrot in the potato field and then be jumping on the couch 15 minutes later. 4. Call if you are bleeding . 5. Don’t call because you can’t find the remote. So I finished up my tables and went home to see her laid out on the couch and I knew right away something was very wrong with her leg. We got in the car hopping clumsily and with a lot of pain. It was hot and I had to pick her sister up at daycare. “Mom, ” Please don’t take forever at Jane’s ,” her brown eyes pleaded with me over her tear-streaked face. “I won’t,” I said with great fervor. Then I went into Jane’s house and had a ten-minute conversation with her about which hospital to go to. It was August 25th, my brother Jeff’s birthday. When Jeff was eight or nine, he ran into a clothesline pole at the end of a grassy hill. It was the only thing standing in the middle of the yard and he broke his femur. Due to the randomness of this event and Jeff’s reliance on high drama at this age, we didn’t take him to the hospital immediately. Actually, I believe I got a bad perm that same day. Jeff spent the whole summer in a body cast. Now, he repairs power lines in extreme storms – climbing 70 feet in the air in hurricane winds. Go figure. I patted myself on the back for having the sense to change out of the all black waitress uniform I wear during the day. No, I am not complaining, I have a great job where I look over the river all day long. The nearest thing to a life or death decision is what type of salad dressing to serve and I have benefits. I am thankful especially as I watch these bills drift in. Oh am I ever grateful. 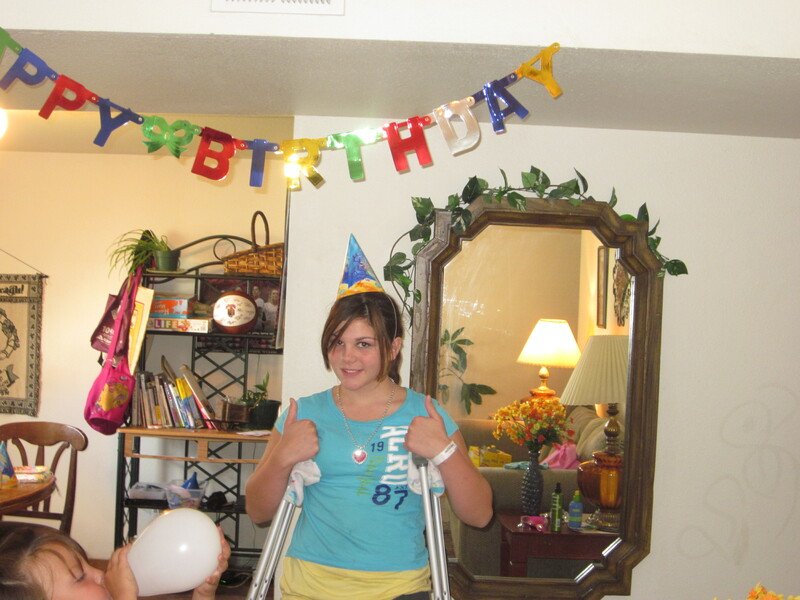 Jesse was fitted with an air-cast walking boot because she had a spiral fracture near her growth plate. They fitted her with crutches and I admit my first thought as I watched her lurch down the hallway was, “We ‘ll be back.” I chased that out of my mind and concentrated on the new reality that things were going to be very different this school year.